I’m blogging for almost 4 years now and this must be the weirdest thing I have ever seen; a skincare company that says NOT to buy its products. 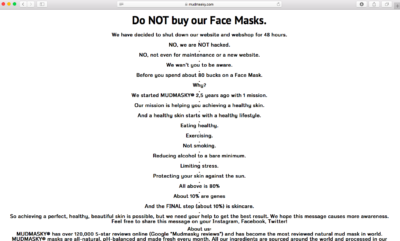 “Do NOT buy our Face Masks.We have decided to shut down our website and webshop for 48 hours. NO, we are NOT hacked. NO, not even for maintenance or a new website. We wan’t you to be aware. Before you spend about 80 bucks on a Face Mask. Why? We started MUDMASKY® 2,5 years ago with 1 mission. Our mission is helping you achieving a healthy skin. And a healthy skin starts with a healthy lifestyle. Eating healthy. Exercising. Not smoking. Reducing alcohol to a bare minimum. Limiting stress. Protecting your skin against the sun. All above is 80%. About 10% are genes. And the FINAL step (about 10%) is skincare. Furthermore they have stated and “about us” and how to reach them. We have called MUDMASKY and spoken to the CEO, Majid Mousavi on why he has done this. The vision and mission of the company is very impressive. 2 years ago we rated MUDMASKY as “best skincare product” and my love for them has only become more!